"The only thing Ukraine needs is peace and return of Ukrainian sovereignty over the occupied territory." 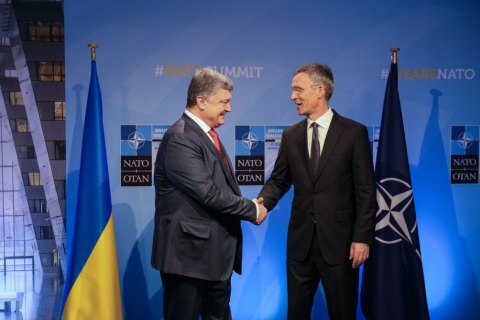 Russia has to stop the ongoing fighting, withdraw heavy weapons and its troops from the territory of Ukraine and release Ukrainian hostages and political prisoners, President Petro Poroshenko has said at a joint briefing with NATO Secretary-General Jens Stoltenberg. "I appreciate NATO’s close attention to the Russian aggression in Donbas and illegal annexation of the Crimean peninsula," he said. "Ukraine remains fully committed to a peaceful solution of the situation through the immediate implementation of the Minsk agreements. The only thing Ukraine needs is peace and return of Ukrainian sovereignty over the occupied territory," he said. Poroshenko once again emphasized that the political solution was impossible until all necessary security conditions were met and Russia fulfilled its commitments. In turn, Stoltenberg said that he planned to discuss the security situation in Ukraine, security sector reform and bilateral practical cooperation. "NATO is firm in our support for Ukraine’s sovereignty and territorial integrity. We strongly condemn Russia’s illegal annexation of Crimea. In eastern Ukraine, the situation remains serious with repeated violations of the ceasefire and human rights every day," he said. Stoltenberg emphasized that the Minsk agreements remained a path to peace and all the parties must deliver on their commitments. "Russia has a special responsibility - it must withdraw its troops and its support for the militants in Ukraine," he noted.